whoa, long stretch of not blogging... it is weird how busy my days have become. not in a bad way. just in a way that i mostly do not do stuff that i would blog about. but: there has been knitting and plenty of reading! i have tons of wip's, but this shawl is the one i am mostly picking up. the yarn is so incredibly soft, the silk and bluefaced leicester blend is such a treat. i have just been making it a simple triangle shawl and have now started a block of garter stitch just to speed things up a little. i really just want to get this one done and around my neck. i finished "The Light Between Oceans" within a few days while we were at the ocean. i have mixed feelings about it. i loved the description of the island and the lighthouse keeper's life. but the story is so heartbreaking it almost hurt literally. i felt such deep pity for Isabel, and started to detest her husband for what he allowed to happen and the way he "solved" everything in the end. have you read it? i'd like to know if you had similar strong feelings about the characters in the book! right now it's a page turner. maybe i'm the last to read it, but i also haven't seen the film yet (in fact i haven't been to the movies for over 2 years...) but Gone Girl is keeping me awake! i plan to finish it before the weekend. 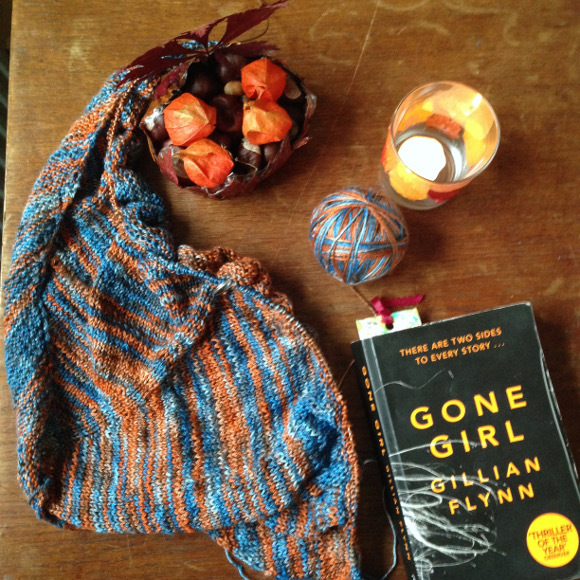 what are you knitting and reading? joining ginny's yarn along once again. have a lovely wednesday! Such a pretty, pretty shawl you are working on, love the colors! Gone Girl, yes, I read that book, but haven't reading The Light Between Oceans yet, it's on the list. Love the colours of your yarn. I have not read it but I think I need too. I read gone girl and liked it enough. but not the potty language... love your knitting!